The Navarre Bible, prepared by Navarre University theology faculty, is considered to be the best Catholic Commentary on the Bible available today. 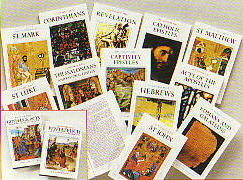 Each volume contains the full biblical text in the Revised Standard Version and the New Vulgate together with extensive commentaries.The commentaries, or notes, help to explain the doctrinal and practical meaning of the scriptural text, drawing on a rich variety of sources: Church documents, the writings of the Church Fathers and Doctors, as well as prominent spiritual writers including Josemaria Escriva who initiated the Navarre Bible project. Each of the gospel texts and Acts include commentary that highlight the implications of the scriptural passage to everyday life. All four gospels and Acts are also available in one hardcover volume.